If Friday April 18 was a Good Friday, then the next day, Saturday April 19 must have been a “Good Saturday” for the family of top Lagos Medical expert, Dr. Seyi Roberts and one of the prominent families in Egba land, the families of Prince Sunmade Babajimi Akin-Olugbade who is the family head of the entire Akin-Olugbade family of Owu Kingdom as their illustrious son, Prince Segun Akin-Olugbade, a British trained automobile engineer and Car Designer exchanged marital vows with the first daughter of Dr. Seyi Roberts, Princess Roberts who is an Elon University of North Carolina trained English and Psychology graduate in Lagos. 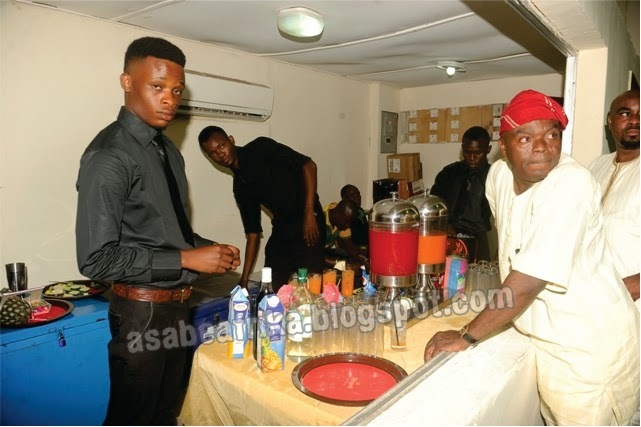 The traditional engagement ceremony which took place at the Harbor Point, off Ahmadu Bello Way, Victoria Island Lagos on Saturday 19 had the presence of the cream-de-la-cream of society in attendance. The white wedding later took place at The Anglican Church of Resurrection inside the 1004 estate, Victoria Island, Lagos on Eater Monday 21 while the grand reception was held at the ball room of the Federal Palace Hotel, Victoria Island, Lagos in the afternoon of same day. Your African Number 1 Celebrity encounter blog asabeafrika was there and brings you behind-the-scene happenings from the one-in-town event which had all the trappings of royalty. 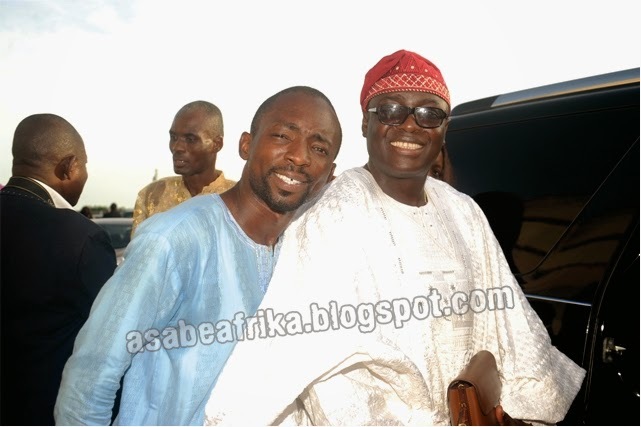 Not many Nigerians who attended the ceremonies knew that both fathers, Prince Babajimi Sunmade Akin-Olugbade (Groom’s dad) and Dr. Seyi Roberts (Bride’s Dad) who is said to be one of Nigeria’s richest medical experts on the account of his status as one of the medical personalities who treats the health of Billionaire business man, Otunba (Dr.) Mike Adenuga and many other top Nigerians are royalties. 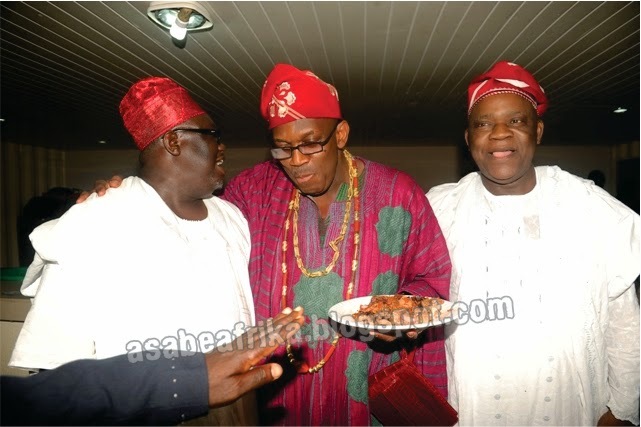 Of course, many Nigerians of old and new generation are very familiar with the heritage of the Akin-Olugbades of Owu Kingdom as their Great father, the former Ekerin of Egba-land and 1st Balogun of Owu Kingdom, late Chief Ohu Babatunde Akin-Olugbade was the former leader of the opposition in the Federal House of Representatives after Nigerian Independence in the 60s. He emerged leader of the Opposition after Chief Obafemi Awolowo his predecessor was jailed. Last year his children honored him with a centenary celebration where his auto-biography was launched. His younger son, the billionaire magnate, Prince (Dr.) Bolu Akin-Olugbade who is the younger brother of groom’s father, Prince Sunmade Babajimi Akin-Olugbade is presently the Aare Ona Kakanfo of Owu Kingdom. On the part of Dr. Seyi Roberts, if not for his medical nomenclature which deprived him of being addressed as “Prince” no one ever knew that he too is of royal blood from Ondo Kingdom. Dr. Seyi Roberts for your information is the first son of the late Olotu Omo-Oba of Ondo kingdom, Oba Frederick Adedayo Roberts. 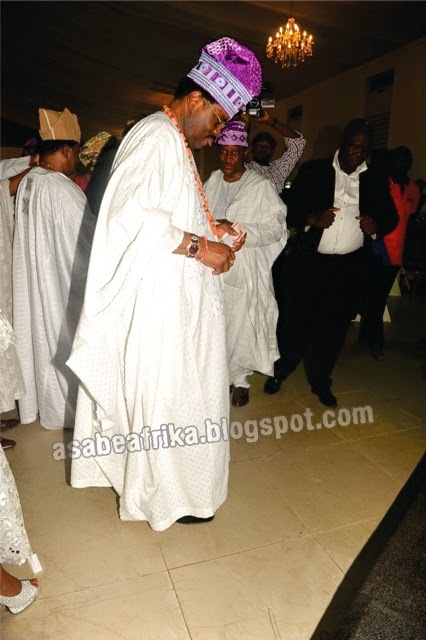 He is also rumored to be one of those whose family lineage might make the line of the next Osemawe of Ondo kingdom. Meet the Bride & her groom. The groom Engineer Segun Akin-Olugbade is the third son of Prince Sunmade Babajimi Akin-Olugbade, the Dawodu and Olori-Ebi of the entire Akin-Olugbade family of Owu Kingdom. He is a University of Coventry, London trained Car Designer. He is one of the very few in the black community in the Diaspora and the emerging African market. His wife Princess Roberts on the other side is the first daughter of Lagos famous Doctor, Seyi Roberts who is one of the personal physicians to billionaire Mike Adenuga Jnr. and many top Nigerians. She had her first degree in English and Psychology at the University of Ghana, Legon before she moved to Elon University of North Carolina, USA where she did her masters in the same discipline.  Presently she teaches at a highbrow children school at Lekki area of Lagos. Dr. Seyi Roberts Best kept secret. This is an unpublished auto-biography of the man, Dr. Seyi Robert. Apart from being one of the founding partners of the famous Holy Cross Hospital in Obalende, Ikoyi area of Lagos, the Ondo state born medical expert is also the Doctor to billionaire business magnate Otunba Dr. Mike Adenuga Jnr. Dr. Roberts is said to have been a private doctor to the Grand Commander of Business in Nigeria for the last two decades and equally one of those who has the ears of the founder of Globacom and Conoil. Why Minister of Communication Omobola Johnson stormed the event. One of the unique qualities of the event is the fact that the two families are very prominent and too big to be pushed aside in anything in society. 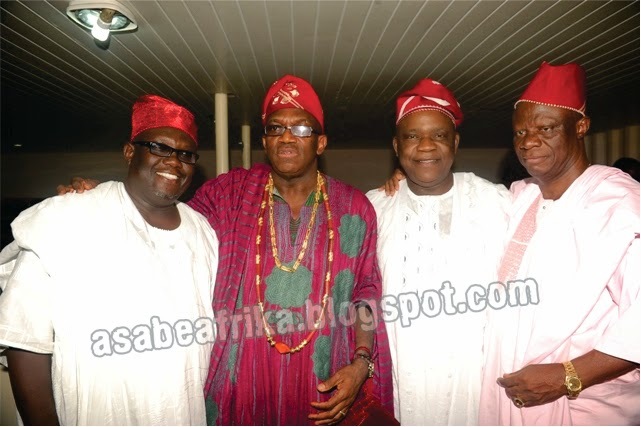 And both the Akin-Olugbade and Roberts’s family pulled the right dignitaries down to the ceremony thereby creating a maximum effect. One of such prominent personalities who graced the Akin-Olugbade/Roberts wedding and equally spent the whole day with the family is the present minister for communication and ICT, Mrs. Omobola Johnson. She was one of the personalities that stood on the brides’ family side. The minister who sat without an air of a minister of the federal republic we later gathered is the niece to bride’s father, Dr. Seyi Roberts. Her father, late Chief Bayo Akinola an industrialist of repute and former Lisa of Ondo Kingdom is the first cousin to Dr. Seyi Roberts and for that reason, the family bond remains so strong. You see why Mrs. Omobola Johnson played the role of an Ebi-Iyawo. 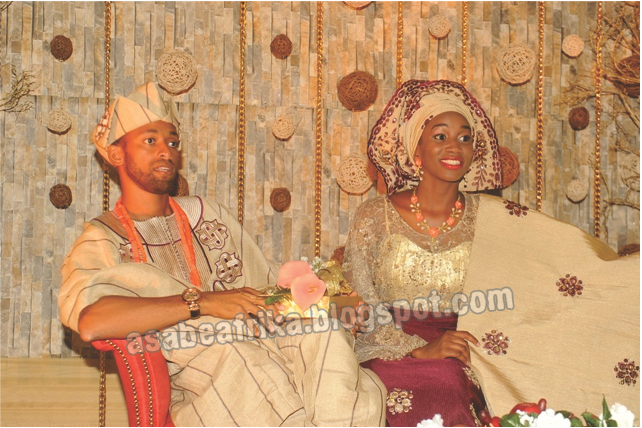 The sight of Chief Kunle Ojora and his beautiful wife, Erelu Ojuolape Ojora was something that added so much glamour to the traditional wedding on “Good Saturday”. The veteran couple and industrialist per excellence who are equally of royal blood sat at a very vantage position on the bride’s side as they spent a whole seven hours during which they carried out some special activities including the negotiation of bride price from the Akin-Olugbade family of Owu. But nobody could connect their relationship with bride’s family until when the former first lady of Kwara State Mrs. Toyin Saraki who is equally the first daughter of Chief Kunle and Erelu Ojuolape Ojora stormed the Federal Palace Hotel venue of the reception on Easter Monday that tongues started wagging. However, asabeafrika was able to get you the real gist as we later learnt that Chief (Mrs.) Toyin Saraki is equally a first cousin to Dr. Seyi Roberts. How? A very impeccable source at the event confided in us that Toyin Saraki’s mother, Erelu Ojuolape and Dr. Seyi Roberts’ mother, Madam Ibirinola Eunice Roberts used to be sisters from the famous Akinkugbe family of Ondo until they both married their various husbands. 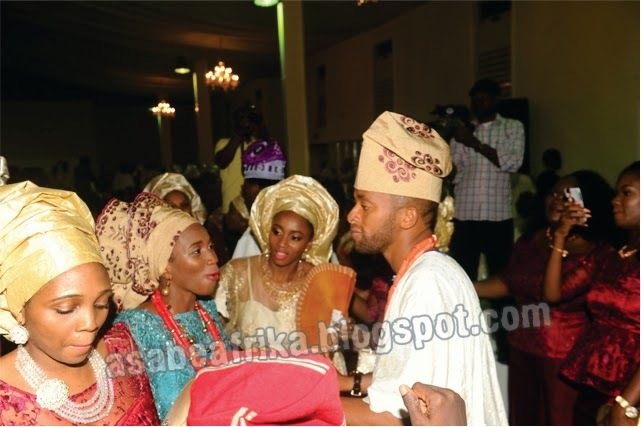 While Toyin’s mum who is the younger one married the young Lagos royal blood Prince Kunle Ojora; her elder sister, Madam Ibirinola Eunice Roberts married an Ondo royal blood in the person of the late Olotu Omoba of Ondo town, Prince Frederick Adedayo Roberts. See how the two sisters invested their love life in royalty? The Aare (Dr.) Bolu Akin-Olugbade ready to merry with the merry-makers. 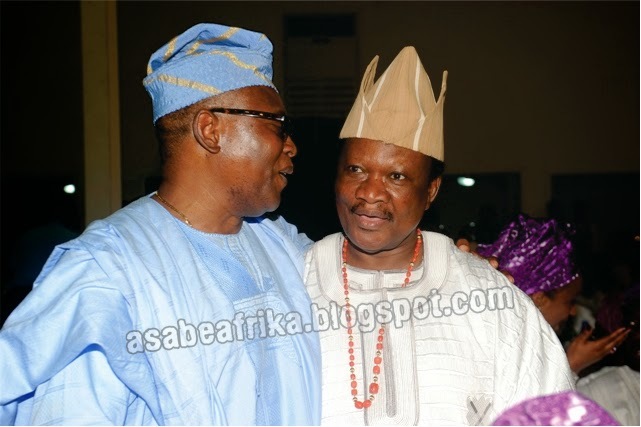 The Akin-Olugbade family of Owu kingdom in Ogun state, South West Nigeria is reputed for two things; royalty and intellectualism. And once their presence was announced at the Saturday engagement, every ear stood attentive. Royalty is their first name while education seems to stick unto them like a second skin. 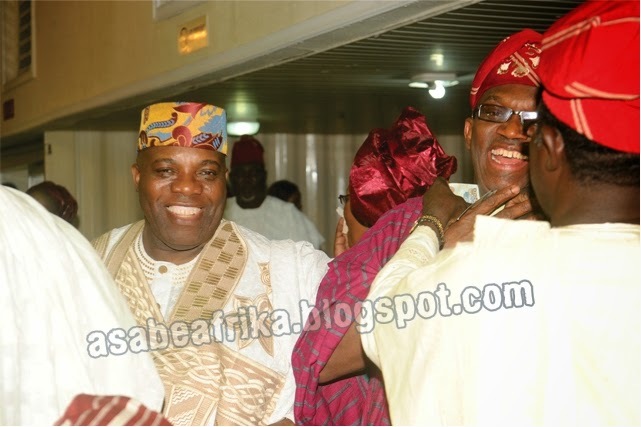 Apart from the Dawodu (head of Family) himself, Omoba Sunmade Babajinmi Akin-Olugbade whose son, Segun was getting married to Dr. Seyi Roberts’ daughter, the other Akin-Olugbades who stormed the event in honor of their big brother are; Aare (Dr.) Bolu Akin-Olugbade an oxford trained lawyer and international business man of repute, Dr. (Mrs.) Tolulope Bolawa (Nee Akin-Olugbade) who is the Medical Director of the famous Akin-Olugbade Hospital in Abeokuta, Dr. and Mrs. Adesegun Akin-Olugbade. Dr. Adesegun Akin-Olugbade is the Executive Director and General Counsel of African Finance Corporation. 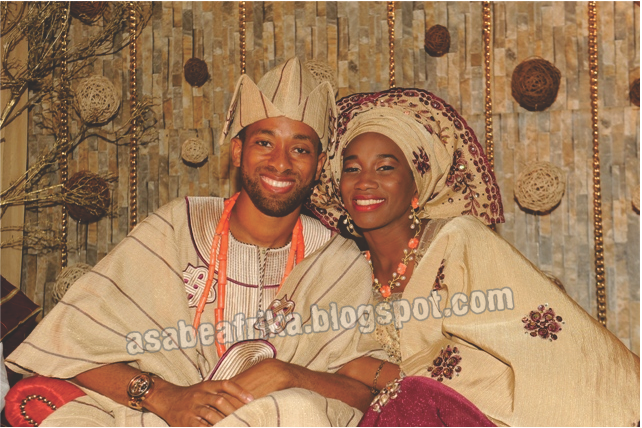 Prince Adesete Akin-Olugbade who is a photographer and international business man came with his wife. And wait for this; Prince Obafemi Akin-Olugbade who is the first Nigerian Gemologist and jeweler based in the United Kingdom. This very intelligent and dynamic Akin- Olugbade is said to also be a hot cake in the United States of America where his talent is quite appreciated. We also had Professor Tiwalade Akin-Olugbade, a former Dean of the Faculty of Pharmacy, Obafemi Awolowo University- Ile-Ife. 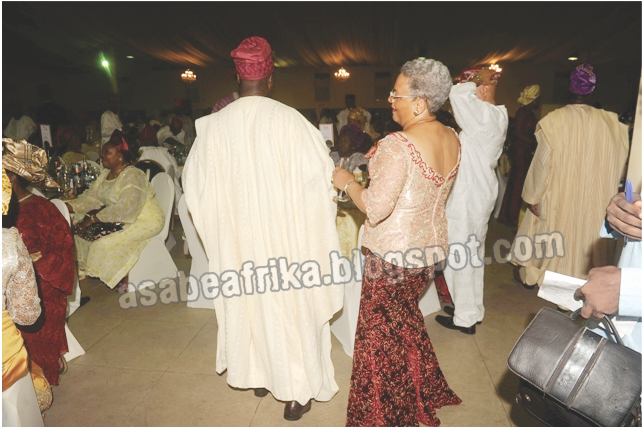 He was there with his wife and a cream of other younger Akin-Olugbades from various professional backgrounds. 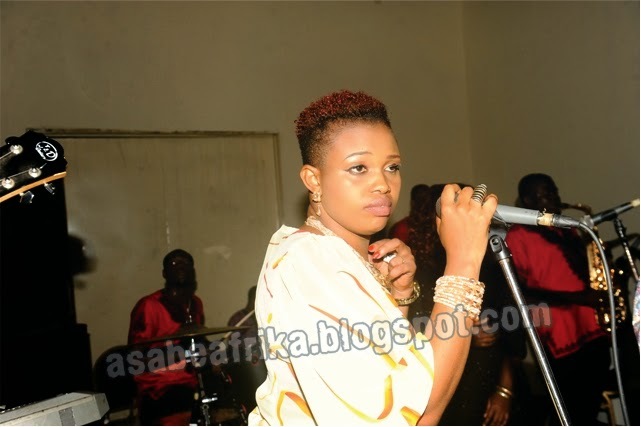 Her name is Mrs. Narie-Laure Akin-Olugbade a Cameroonian by birth. This very beautiful and well cultured lady is the wife of Dr Adesegun Akin-Olugbade the Executive Director and General Counsel of the African Finance Corporation. The two couple who are global bankers per excellence were said to have met while Dr. Adesegun Akin-Olugbade was still working with the African Development Bank (ADB) from where he moved to the African Finance Corporation (AFC) which is one of the world’s biggest finance organization. Mrs. Narie-Laure Akin-Olugabde is presently the representative of the African Development Bank in Ghana where she is resident. She and her husband made both the traditional and white wedding thick with their gait and presence. Meet Bride & grooms’ Siblings who made the groom’s train. 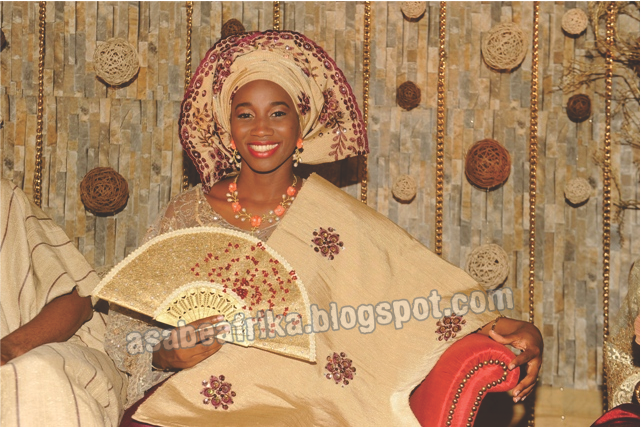 Both the Akin-Olugbades and the Seyi Roberts families gave in their best human resources to make the occasion thick; while some made the bridal train, others made the grooms men at their brother’s and sister’s wedding. Among such is Damilola Roberts, the scion of the Dr. Seyi Robert’s dynasty, Damilola is a professional swimmer and Olympic Medalist winner for Nigeria. His brother, Demilade Roberts who is a professional photographer and business man also made the day for his sister as he coordinated all the photograph session at the event and equally ensured that all went well on his sister’s happiest day. His sister, Dedun Roberts an architect and alumnus of Kwame Nkrumah University of Science and technology, Accra also played her role among the bride’s maid as she made things happen for her elder sister, Princess on her day of joy. On the Akin-Olugbade side, we had Akinbo Akin-Olugbade who is the second son of Prince Sunmade Akin-Olugbade. Akinbo who is a Computer Engineer by training was seeing running around to make things work out for his brother. Meanwhile Akinkunmi Akin-olugbade, the eldest of the Sunmade Akin-Olugbade’s children who is presently in the United Kingdom couldn’t make the trip home as he was said to have been engaged with a foreign assignment. Akinkunmi Akin-Olugbade, 35 had his first degree in Engineering at UNILAG while he made a second degree at the University of Birmingham, Birmingham City, United Kingdom. He is said to be single, eligible and searching. Children of Aare Bolu Akin-Olugbade also made the train with their unique look and splendid dress sense. Trust this dandy and stylish Billionaire and younger brother of groom’s dad, Aare (Dr) Bolu Akin-Olugbade, the Oxford trained lawyer and business man is a show-stopper any day, any time. When he arrived the venue with his beautiful wife, Ladunni in his Customized 2014 Roll-Royce Phantom car with tag number “Bolu 9” every eyes turned in his direction at the car park as the security guys ensured he had a good space to park. The Aare later moved majestically to a special seat arranged for him beside his senior brother, Omo-Oba Sunmade Akin-Olugbade where he acted the role of one of the fathers of the groom (Baba Oko) and equally took part in the act of paying of dowry and other custom related activities. But the real show started when the entertainment began, as the Eboni Band which gave several melodious tunes to the delight of guests started singing the praises of Bolu Akin-Olugabde in relation to his title as the Aare Ona-Kakanfo of Owu Kingdom, one of his bouncers quickly corrected the musician by whispering something into his ears. And immediately, the music man re-echoed the message out by singing and describing Akin-Olugbade as what? Aare Ona-Kakanfo of the Universe; yes Aare Ona-Kakanfo of the Universe, nothing less. 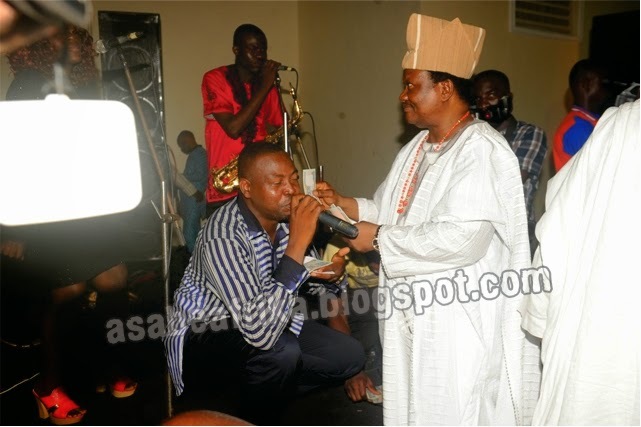 Of course the musician got the reward instantly in naira rain of N500 denomination. Please next time you see Aare (Dr.) Bolu Akin-Olugbade, don’t ever make the mistake of describing him as “Aare Ona-Kakanfo of Owu Kingdom any longer or else you are bound to lose so much in terms of naira and human dignity. Just call him Aare Ona-Kakanfo of the Universe and ye shall be blessed beyond ordinary word of mouth. Hallelujah! Bride’s mother is a Ghanain. Not many knew much of her until that day; she is the wife of Dr. Seyi Roberts. Her name is Mrs. Alero Roberts, a first class Ghanaian intellectual. She is said to be the secret behind Dr. Roberts’s good looks and stylish dressing. Mrs. Alero Roberts is the first daughter of top Ghanaian intellectual, Professor Kofi Duncan. The Prof was at the event with his younger wife as it was rumored that he lost his first wife (Mrs. Alero’s mother) long time ago. He came all the way from Ghana with his wife and some prominent members of the Duncan family of Ghana. The octogenarian mother of Dr. Seyi Roberts also stood up for her grand daughter’s wedding which happens to be one of the greatest instances that characterized her life as a child of God as Mama was piloted to the event in her best regalia. Although very aged but the happy Mama Ibirinola Eunice Roberts (Nee Akinkugbe) who is also the elder sister of Erelu Ojuolape Ojora made a grand appearance at the event. They are wives of the Akin-Olugbade brothers; leading the pack is Mrs Folake Akin-Olugbade, wife of Prince Sunmade Babajinmi Akin-Olugbade father of the groom, Mrs. Ladunni Akin-Olugbade, the Yeye Aare Ona Kakanfo of Owu Kingdom, sorry, of the Universe and wife of Prince Bolu Akin-Olugbade with her Cameroonian counterpart Mrs. Narie-Laure Akin Olugbade wife of Dr. Segun Akin-Olugbade of African Finance Corporation. and not rich had more than enough to eat and drink. Why Doyin Okupe Stood all day. 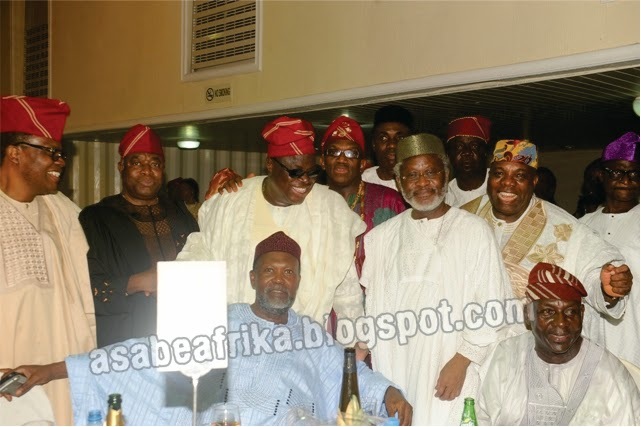 It seems the event had a mystery woven around the Ibadan Grammar School old boys Association. 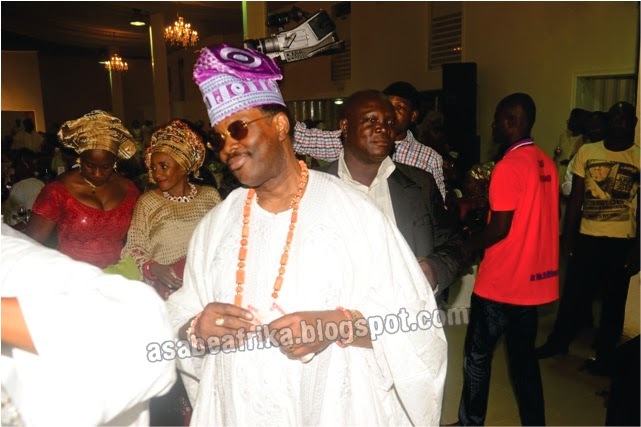 To start with, the groom’s father, Prince Sunmade Akin-Olugbade is an old student of that prestigious school likewise Dr. Seyi Robers the bride’s father is equally an old student of the school. 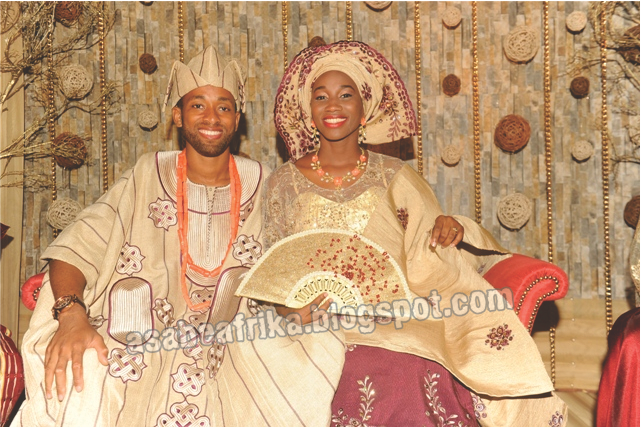 Wait for this; on Easter Monday when the white wedding took place at The Anglican Church of Resurrection inside the 1004 estate, Victoria Island, it turned out that the officiating Priest, Venerable Arch-Deacon Muyiwa Oyewole who joined the couple in holy wedlock was also an old boy of Ibadan Grammar School. Senator Femi Lanlehin who is a friend of grooms’ dad and who was there is also an old boy likewise the Alake of Egba-land, Oba Adedotun Gbadebo (Okukenu IV) who graced the occasion in person is also an old boy of the Ibadan Grammar School and many more other dignitaries who filed out for both bride and groom’s dad in honor of their children’s wedding. What a mystery of life? 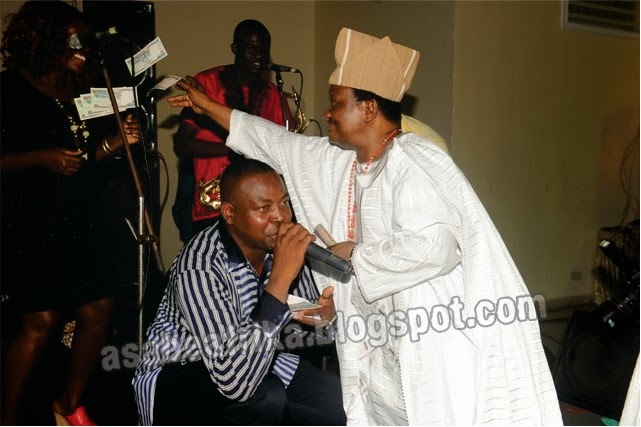 And don’t forget that even Dr. Mike Adenuga Jnr., the man who pays Dr. Seyi Robert’s fattest bills is also an Ibadan Grammar School alumnus. 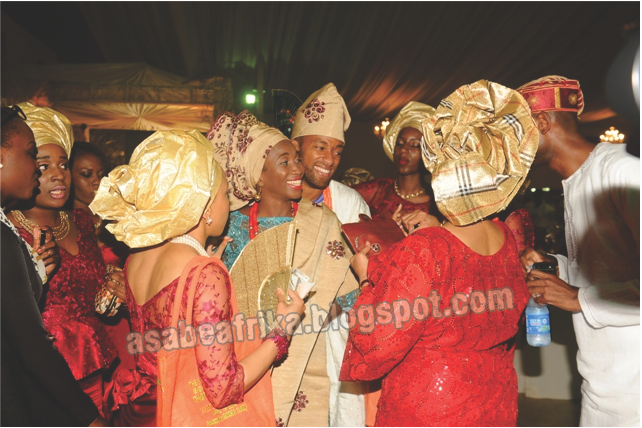 This is a fantastic traditional wedding. 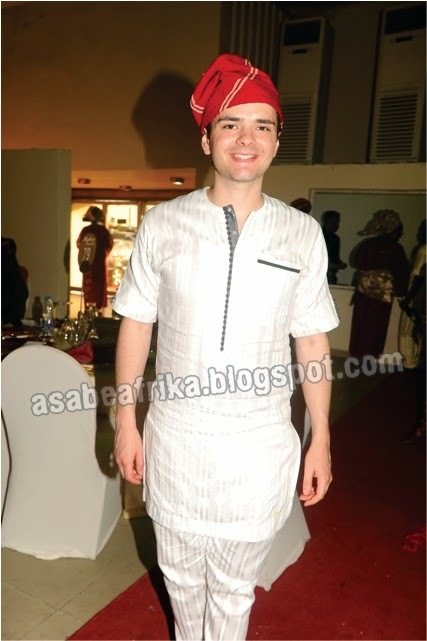 I am proud of the Oyinbo man who dressed in our attire to the Akin-Olugbade and Roberts' wedding. Fine reports. I like this blog, it is breezy and entertaining. Kudos guys! One more minor error, Prince Bolu Akin-Olugbade is actually a Cambridge trained commercial law expert, not from Oxford. Good blog! But get an editor. There are several english grammar errors eg. It is 'every eye' not 'every eyes'!! !